Cic Saor readers are well aware that I've been a fierce critic of the Guardian's Ireland correspondent Henry McDonald over the last few years, but its only fair that he should be praised and defended when he gets it right, which he did do with a strong piece he wrote yesterday on the book Lethal Allies (see yesterday's blog). 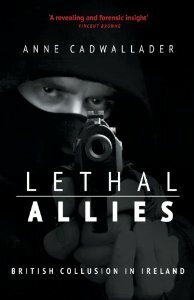 It seems that with Anne Cadwallader’s new and widely publicised book Lethal Allies, the dam walls of silence and censorship that have been built around the collusion story have finally been burst asunder. The decades long part played by the British state (acting in concert with the worst and most sectarian elements of loyalism in Ireland) is now accepted as an appalling fact. It is the fact, in my opinion, that the highest officers of the British state aligned themselves with rabidly sectarian murder gangs that made it a British Jihad. Why hasn't Rupert Murdoch’s kingmaker in Ireland been investigated in Ireland? Alex Marunchak is a Ukrainian national who rose to the top of Rupert Murdoch’s News International media organisation from the 1980s through to 2006. (He was also vetted by MI5, subject to the Official Secrets Act and employed by London’s Metropolitan police as a translator/interpreter for whom he worked for nearly 20 years).